Shopping for a copper sink can be confusing. In this article, we will guide you through information and help you select the right sink for your project. You will learn some new terms like "living finish" and "metal gauge". We want to prepare yourself with information before you buy. Selecting a kitchen or bathroom sink was easy in the past. There were just a few large companies selling ceramic, enameled steel, cast iron and stainless steel sinks. In the past decade, there has been an explosion of new products in the sink category and a growing demand for hand crafted and custom work. There have been several "new” sink mediums gaining recent acceptance – glass, various stones, brass, copper, and even wood. This article will focus on copper sinks and what to look for before making your purchase. 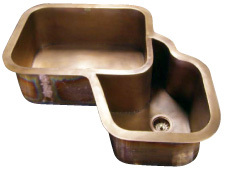 Our entire kitchen and bath copper sinks are made here in Indiana by our artisans. We do not do wholesale or retail our sinks. Everything we do is custom made for you by us and should be considered a one of, since we can make our sinks in size down to 1/16” in any direction. We buy all of our copper here in the U.S.A.; you will find no imported copper goods on our website or in our shop. This paragraph will cover the difference between gauge of metal and ounce weight. Copper is sold by weight or by ounce weight to be more specific. All of our kitchen and bathroom sinks are made from 48 oz. pure American copper. What this means is that 48 oz. copper weighs 48 oz. (3 lbs.) per square foot of copper. These days gauge or decimal thickness is used to describe the thickness of certain metals, like steel and stainless steel. Our 48 oz. copper is .070” thick which is between 14 to15 gauge. We will talk a little about the difference between smooth and hammered sinks. Smooth sinks are going to show scratches a little better than a hammered sink. The scratches are the same thing you would expect with a stainless steel sink. Hammered sinks help to hide any scratches you get through the use of your sink. We are a little different than most companies when it comes too hammered versus smooth sinks. Some of our smooth sinks cost more than a hammered sink. The reasoning is that it takes a lot of time to get a smooth sink to look smooth after we weld it, as a hammered sink is supposed to look a little uneven and helps hide the welds. We don’t charge extra for hammering on any of our products except for hand hammered spun sinks. Let’s talk about copper patina. Patina on all copper will change variably over time depending on the type of patina and how well the sink stays sealed. We use only natural materials to patina our products, no heavy dangerous chemicals to you or us. If you go with a no patina sink, over time it will patina itself, copper wants to be a brown color, it will most likely not turn green inside your home unless you get an acid based chemical on it. If your copper sink has a patina, over time a scratch will disappear and be colored like the rest of the sink. Copper is a living organism and unlike stainless steel it can repair itself. You will still have a scratch but won’t be able to see it. Copper is a very durable sink material, it will last as long as your house does. No matter what happens to the patina of your sink it can be fixed and repaired. This is the main difference between copper and any other medium for sinks. If you remodel your kitchen and the sink is to dark or to light then you can change it, is the only kind of sink on the market that can be interchangeable with any style of kitchen through the years. After we finish the copper product, we put on a coat of wax. 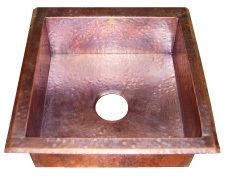 For our custom copper sinks, we offer either a wax coating, or a lacquer coating. Your choice may depend on your likes. If you find a certain patina, and you wish that patina to stay the same over many many years, you may want a lacquer clear coat applied. With lacquer, there is virtually no maintenance, you don't have to rinse the sink, nor dry it with every use. You only need to stay away from harsh chemicals and abrasives when cleaning. The downfall of a lacquer coated sink, is that if you do wish to change its color in the future, you will need to remove the lacquer fully with a stripper, or sanding it completely off; before you can re-patina. Also, if you get a very severe scratch, you may need to re-coat this scratch with lacquer. If you wish to have the opportunity for your sink to change over time, having a "living finish", or even allowing the possibility for one of your chosen patinas to be able to change further over time, you may just want a wax coating. Basically wax is a barrier to prevent fingerprints while installing, and also a barrier to prevent liquid spots from discoloring the copper quickly. The wax basically "buys time" for you to wipe dry or clean off the spot where a chemical is sitting on it, before it will penetrate the wax. Sitting water (or other liquids for that matter) will penetrate the wax and patina the copper underneath over a short period of time. However, with wax, if you get a stain you can clean the wax off with acetone (nail polish remover) and remove the stain. Also, you can always change the finish on your copper product in the years to come using wax. We can talk you through ways of fixing your patina over the phone, or we can send you the necessary solution, material to fix your finish for a charge. This allows you to have the option to always change your copper product, and also gives you the ability to fix a scratch, unlike many other metals. All of our sinks are standard with either wax or lacquer coating, free of charge. We just need you to decide which method based on the information above. If you are still unclear, and would like to discuss the finishes more thoroughly, please give us a call or email us. The two styles of copper kitchen sinks we sell are Signature Series and Traditional Series copper sinks. The difference between the two styles is in fabrication and the thickness in copper used. Signature Series sinks are a little more expensive and are made with 48 oz. copper and the Traditional Series is made with 48oz. copper also. The fabrication difference is in how it is made. Signature Series has 1 ½” radius corners on all four corners and around the bottom. Where we weld them together is ground flat and you can’t tell where the corners are welded together. The Traditional Series is made with 90 degree square corners on the four sides and around the bottom. The welds are down the four corners and are not grounded down. The welds will only be about a 1/8” thick and barely noticeable. We offer these two styles of sinks to give you choices depending on your preference and budget. The different types of kitchen sinks we sell are farmhouse apron front, drop-in and under mount. We can make a farmhouse apron sink to be a drop-in or under mount. A regular drop-in or under mount will come with just a 1 ½” rim around it for attaching it to whatever countertop surface you use. The drop-in and under mount styles are made the same except the under mount rim is flat and the drop-in has a ¼” caulk bevel to seal it to the countertop. Circle City Copperworks also fabricates round and special shapes of sinks for the kitchen, bath, and/or bar. These spun and vessel sinks are made from flat pieces of copper that are spun to round bowls on a lathe. Spun sinks also come smooth or hammered by hand. This is a process somewhat like turning wood. We also make round prep sinks and vanity sinks that are made custom by hand.